I straightened my bowtie and tucked in my pocket square this evening to see Steve Cohen perform his show Chamber Magic at George Brown House for Luminato, where the dress code is as fancy as the attendees (let’s just say that for this evening anyhow, his sobriquet The Millionaires’ Magician was well deserved). The show, a classic parlour magic display designed for close audiences, sent me running home to the interwebs to try to figure out how some of his tricks had been performed. I’ll say only this: even online, magicians are pretty tight-lipped. 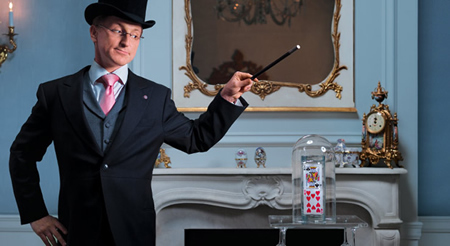 The pleasure of a magic show is in allowing yourself to be amazed – and it’s nice to be able to stay amazed. Cohen’s skills are really a pleasure to watch as he performs of variety of tricks that are indeed bewildering and delightful. You understand that, on some level, something must be happening somewhere you can’t see it, but that feels beside the point for a moment (except to the gentleman sitting a bit in front of me, who murmured his guesses to his companion frequently). When the card is turned or the glass fills with the correct colour of liquid, we in the audience both expect it and cannot fathom it. I got the sense that Cohen, a graduate of prestigious schools, must have loved magic so much – to the exclusion of all other things – that he chose to pursue it professionally. His love shows in the work. He’s buoyantly happy to be performing, twinkling with delight as he shows us card tricks, mentalism, and other close magic. It’s clear that he’s in his happy place as he gathers the audience close to watch, really watch, watch from a foot away as he makes cards perform miraculous feats – including re-arrange themselves inside a box, inside my blazer’s pocket, into precisely the same order as the cards in the box in the blazer pocket of a guy standing six feet away from me. It was amazing to watch. The sheer difficulty of the conjuring must be extraordinary – I don’t know for sure, because I have no idea whatsoever how any but the very simplest trick (making one pen into two) might have been done – but I’m pretty sure that if it were easy to make a brick or a chocolate malted appear out of thin air that more people would be doing it. Now, please understand: this isn’t flash-of-smoke-and-Neil-Patrick-Harris-disappears magic. You won’t see any doves, bunnies, glass tanks of water, straightjackets, or eyeliner on display at the intimate George Brown House show. Just a cheerful-looking bespectacled guy in nicely cut morning clothes, with a carrying light tenor voice and extraordinary prestidigitation skills, prepared to let you feel like a kid again in the best possible way, all wonder and delight. Chamber Magic is playing at the George Brown House, 186 Berkeley St.
Photo of Steve Cohen by Clay Patrick McBride.